When it seems that the whole of Hobart is at the beach, I am amongst a small audience in the Peacock Theatre to experience an intriguing show inspired by Douglas Mawson's expedition to Antarctica. Let's just get it out there from the beginning; opera can be hard to both stage and watch. While The Call of Aurora had some definite highlights I found it difficult to enjoy. My foray into opera includes a strange and painful experience watching and reviewing Beijing opera a few years ago, a more recent trip to MONA cinema to watch Maria Stuarda by the Metropolitan Opera in New York and the many years listening to Maria Callas, Pavarotti and other popular opera performers. That's my experience of opera; aside to say...that I really like it. Even in my brief encounters I have felt the human voice hit my heart, wrap itself around me and make me feel extraordinary. 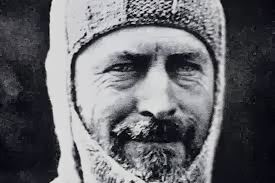 The Call of Aurora is the story of Sir Douglas Mawson; his fellow explorers, his fiance and the extreme conditions the men endured in Antarctica. December 2013 is the 100 year anniversary of Mawson boarding the Aurora and returning to Hobart after 2 years stranded. The show is made up of 4 parts; a prologue and three scenes, with an interval after Act One. On a relatively bare stage the quintet is positioned front of stage with conductor and music director, Gary Wain. Joining the musicians are Philip Joughin playing Mawson, Jamie Scott as Sydney Jeffryes, Jennifer O'Halloran playing Paquita Delprat and Auror (the spirit of the south) and Nick Monk is cast as Mertz, Madigan and the ghost of Robert Falcon Scott. The champion of this production is the musical composition and the performance by the quintet. It is exquisite. Many times I closed my eyes just to listen to the music. Written by Joe Bugden, the music and libretto is superb; cleverly incorporating the whimsical with the more intense arrangements. It encapsulates the sense of insanity that must swim through the minds of those explorers who find themselves in such an alien and unforgiving environment. This show would have benefited enormously from improved design. Still and moving images were projected onto screens at the rear of the stage, however, I found the positioning of these as well as the selection and quality of the moving images a distraction from the performers, rather than adding to it. At other times, particularly later in the production, the images worked to create atmosphere and narrative, but it was inconsistent and needed more direction. Similarly the lighting design did not give justice to the performers or story. Perhaps this was due to limitations at the Peacock Theatre, but whatever reason, it was disappointing, especially as the subject matter would lend itself to some fantastic imagery. Nick Monk was the stand out in this production. His voice was rich, full of expression and he characterised his 3 roles extremely well. He engaged with the audience and provided variation and movement in his performance. Alternatively, I found Philip Joughin's depiction of Mawson very static and passionless. As the lead character, this was disappointing and I was confused as to whether the standoffish and unemotional portrayal was intentional. Jennifer O'Halloran's voice was beautiful. I feel that her performance would have benefited from improved design and direction of movement on stage to better represent her roles. Jamie Scott was at his best in the final scene. Portraying the wireless operator, Sydney Jeffryes, Scott brought reality to this role. It was earthy, gritty and slightly uncomfortable. All vital ingredients for the portrayal of a man slowly going mad. There were lots of moments in this production that I enjoyed. It was beautiful when Joe Bugden, as one of the explorers in the hut, was gathered with the other men. They were playing cards, writing, listening to the wireless and he picked up an acoustic guitar and started playing. It was simple, emotive, and just right. After a few minutes, the quintet joined in and it made for one of the more successful scenes. It is a priority for opera performers to keep time with the orchestra. However, there were times throughout the last scene particularly where the constant glancing towards to the conductor, for timing cues, was very noticeable and distracting and broke the required tension in the narrative. The conductor, Gary Wain did an amazing job and he and his musicians; Jill Norton, Derek Grice, Nara Denis, Magnus Turner and Calvin McClay should all be congratulated. Mawson's story deserves to be told and opera could be the medium, but The Call of Aurora requires more refinement as a production to do this successfully. The Call of Aurora was performed for a brief season at The Peacock Theatre, Salamanca Arts Centre, Hobart.